Master Sgt. Antonio Gonzalez, Provost Sergeant, and Mr. Richard Camacho, Physical Security manager, present a memorabilia box to Richard Bade, second from left, accompanied by his wife Wilma, on Sheridan Kaserne, Oct. 1, 2018. 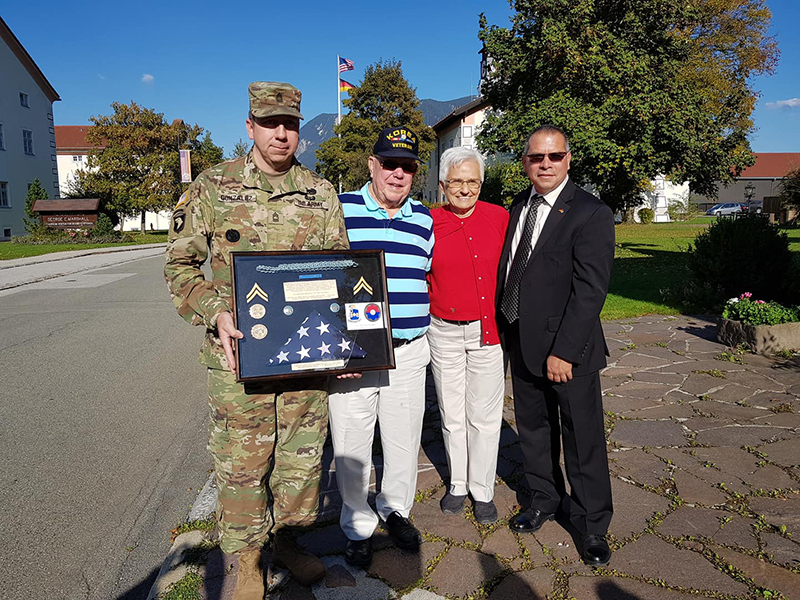 GARMISCH-PARTENKIRCHEN, Germany — When Michael Bade asked his congressman for assistance in visiting the U.S. Army Garrison Bavaria–Garmisch community with his father, 85-year-old Army veteran Richard Bade, the wheels started spinning to make it happen. 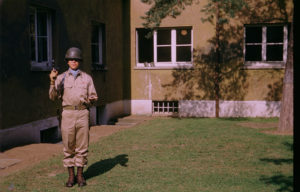 Bade had been stationed in Garmisch in 1955 with the 1st Platoon, Company C, 39th Infantry Regiment, U.S. Army Communications School, one of three regiments of 9th Infantry Division headquartered in Fuerth, Franconia, 1954 – 1956. He attended training for radio and telegraph communications. To accommodate Bade’s request, a team of Garmisch community professionals was quickly formed: Provost Sergeant Master Sgt. Antonio Gonzalez, Richard Camacho, Physical Security manager, and Deputy Garrison Manager Brandi Stauber. The team developed a tour program for the Bade family’s trip back in time on Sept. 30. Richard Bade ca. 1955 as a young Soldier with the 1st Platoon, Company C, 39th Infantry, 9th Infantry Division. On a beautiful warm Sunday in fall, the Garmisch team welcomed Bade, his wife Wilma, their son Michael and his wife Julie, at the Garmisch train station. The tour began at the Olympic Ski Stadium where Bade remembered skiing and once had lunch at the Olympia Haus. They passed the beginner’s hill at the Armed Forces Recreation Center’s Hausberg Lodge, where countless Soldiers learned how to ski (and still do), then on past the former Patton Hotel. By the time the Bade party arrived at the Eibsee in Grainau, Bade’s memories from the 1950s were falling back into place. As the group passed the Eibsee boat rental he recalled standing in a small clearing overlooking the lake. When the group arrived at the Sheridan Kaserne chapel, the team surprised the veteran by presenting him with a glass-enclosed box that included a flag flown over Garmisch for 24 hours, his unit patch, and some items he had hoped to find at “clothing sales” over the past six decades, including a special neck ascot he always wanted. Gonzalez and Camacho found some of the items at the military clothing sales store in Grafenwoehr, while others were found on the internet after Stauber contacted the U.S. Army-Europe historian to verify Bade’s unit information. For the past 63 years, Bade wanted to return to Germany to visit Bavaria and the Garmisch area. However, after he left the Army, he went to college and started his own business. It wasn’t until he retired that his son planned the family trip.